The Unified Gospel of Jesus. ONE is the unification of the four separate Christian Gospels of Matthew, Mark, Luke and John. There may be four source Gospels, but there is only one Gospel of Jesus. Authoritatively documented to the source works with 3,000 references back to the Gospels. The Universal Version, unlike the Divine Version, is specially prepared with sensitivity for use by non-Christians, as well as Christians who seek a more philosophical or transcendental study of Jesus and his teachings. A must-have unique work for the casual reader and scholar alike. Scholarly and easier to read. 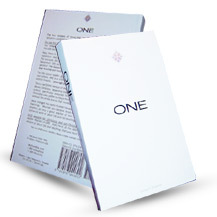 ONE is a truly unique and important work that everyone should read now. Will ship with a limited supply Original Printing designation when available. Holiday gift purchases will receive an advance gift card announcement pending actual shipment. View Divine Version Inside (pdf). Also available: Want Even More Buying Options? Therefore, the Universal Version is unique in two ways: first it is a consolidation of the Christian Gospels, then it is prepared with sensitivity as stated. The Universal Version does not reference certain miracles that rest on Christian faith, such as Jesus walking on water or rising from the dead. We recommend that Christians start with the Divine Version. Christians can then, only if they are so inclined and philosophically open-minded, follow-up with the Universal Version. The opposite is true for non-Christians. We recommend that non-Christians start with the Universal Version, then, if they are so inclined and philosophically open-minded, follow-up with the Divine Version.